The Original Philadelphia Yarn Shop! Located in the heart of Chestnut Hill's charming business district, The Knit With is Philadelphias full service, specialty yarn store dedicated to inspiring and satisfying the entire knitting communitys needs for yarns, knitting products and services in fulfillment of the art and craft of knitting. Since its founding in 1970, The Knit With has been delighting an entire knitting community, drawn from throughout the greater Philadelphia area and drawn from across the generations, with the yarns, designs, and knitting-related products and services which knitters desire and deserve. Welcome to our world of knitting excitement! The Knit With, Philadelphias oldest specialty knitting shop, is located at 8226 Germantown Avenue in the historic Detweiler House, among the boutiques, shops, galleries, ateliers and restaurants which have made Chestnut Hill known as a premier shopping destination in the Philadelphia area. Complete directions to travel to The Knit With from throughout the Philadelphia region are on the Directions page and the knitting shops hours are listed on the Store Hours page. The Knit With's focus is simple: to provide Philadelphia knitters the best selection of quality knitting yarns--in a palette of irresistible colors and an array of sensational textures--and a complete range of quality instruments, and the designs of leading fibre artists and publishing houses--as well as designs from our own imagination--and the classes and services to inspire and keep this knitting community in stitches! Specializing in natural fibres, designer, artisan and novelty yarns, The Knit With offers discriminating knitters (and Crocheters too!) throughout the greater Philadelphia area a broad spectrum of fibres in a dazzling array of textures and an extensive palette of colors. Stocking almost 500 yarns year-round, most in numerous shades, The Knit With presents handknitters with a complete range of yarn weights, from lace and fingerings to the super bulkies, to satisfy this creative community's desires for artistic, if functional, expression. The extensive palette of yarns, so surprisingly displayed in the limited space of a historic building, are all carefully culled from the most interesting offerings of the leading suppliers of hand knitting yarns, as well as artisan and specialty yarn studios. The yarn palette reflects the seasons and changes twice a year, in early March and late August, and is displayed for your shopping pleasure on the Fibre Palette page and, of course, in-store. The community of knitters who call The Knit With their knitting home, whether drawn from across the greater Philadelphia area or from the breadth of North America, rely upon The Knit With to satisfy their needs for quality knitting instruments and knitting "necessaries"--those gadgets which help make every knitting project successful and less stressful. Needles, in all sizes from (US gauge) 0 through 50, are stocked in a variety of lengths and in an array of materials. The knitting necessaries, almost as important to the craft of knitting as needles themselves, are never an after-thought at The Knit With.. Here, you have the ability to select different styles and sizes of necessaries which best fit your knitting style. Find the needles and necessaries which best suit you at the Needle Niche page. Beginning and advanced knitters alike can choose from among thousands of published patterns for every conceivable garment from the world's foremost designers and publishers. In pattern selection, our keystone is to offer knitting patterns knitters want to knit; in the event that a published pattern is not available for garment you want to make, we will gladly write, for you, a customized pattern to accompany your purchase of yarn. In addition to the broadest selection of patterns available in the Philadelphia region, The Knit With specializes in trade books related to knitting -- all selected for their appeal to knitters -- really, a specialty bookstore within the shop. Hundreds of knitting related titles, from the latest releases to the honored classics, whether to fulfill your desire for your own knitting library or for gifting to knitting friends, is available to you on the The Bookshelf© page. The Knit With continues to publish the knitting patterns of our founding proprietor, Marge Casale , who grew up on a sheep farm along the foggy and windswept, yet idyllic, North Atlantic coast. Marge took her inspiration for her custom designs from the cycle of the seasons and the infinite variety of stitches available through knit and purl -- so similar to the ever-present tide's ebb and flow. Since founding The Knit With , Marge has broadened the community of knitters by welcoming thousands to the joys of knitting, and crochet, through her classes and workshops. Her teaching philosophy, to gladly share the skills necessary for others to become liberated and independent knitters who proudly wear their diplomas, continues. The Knit With offers several seasonal series of classes throughout the year led by knowledgeable knitters and experienced teachers drawn from the shop's staff and friends. For more information about the next series of class offerings, see the Knitters Academy page for classes offerings, course descriptions and instructors biographies. Included within The Knit With 's range of specialty products for the knitting is the Buttons in Bloom ® collection of antique, artisan and specialty buttons created from nature's bounty of woods, pearls, shells and other precious and semi-precious materials. A specialty boutique within the store, and treasured by handknitters throughout Philadelphia and its environs, the Buttons in Bloom ® collection numbers in excess of 3,000 distinct buttons styles or sizes all carefully selected to enhance the beauty and artistry of handknit garments and constantly changing. To browse through this treasure of art in miniature, go to the Buttons in Bloom ® page. If your own excitement for knitting does not extend to the assembly and finishing of your hand knit garments, The Knit With offers professional finishing and tailored buttonhole services. The experienced fibre artisans associated with The Knit With will gladly assemble and finish your handknit garment so that its looks and wears as a handmade garment and not one which was homemade. To learn more about the specialized services offered by The Knit With , go to the Services page. We recognize the website communicates only a virtual shadow of the knitting excitement experienced by the community of knitters who call The Knit With their knitting home. When in-store, you can look forward to the full sensory stimulations of the colors and textures of the yarns and sweaters displayed. Until then, enjoy your exploration of our world of handknitting excitement! Again, thanks for visiting. We hope you will visit again soon -- and we look forward to meeting you personally in Chestnut Hill or via e-mail. Thank you for visiting The Knit With. Listed on the National Register of Historic Places and recognized by the Philadelphia Historical Commission, The Detweiler House dates, in its earliest of three parts, to 1734. 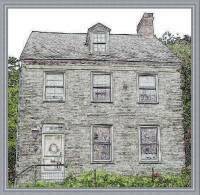 The Detweiler House is the oldest surviving structure in Chestnut Hill and is built of dressed and field Wissahickon schist, also known as Chestnut Hill stone. Originally constructed in the rural Germantown farmhouse style, with the kitchen (and a well) in the cellar, a 1795 extension and partial reconstruction gave the house its faintly familiar Federalist architectural style (alas, partially lost to subsequent Victorian and later modernizations, the most recent of which included a rear wing, erected in 1904 after demolition of the summer kitchen). Notable among the visible original architectural elements is the front door to The Knit With , fashioned of chestnut wood and constructed in the old way of peg assembly. Four fireplaces (one visible in the yarn store) and three staircases are among the other architectural elements which visibly survive these many modernizations through the years. These modernizations not withstanding, The Detweiler House is an outstanding, and rare, example of residential summer beam construction allowing for spacious interior rooms. For most of its 270 year history, The Detweiler House was occupied by successive generations of one family--until the mid 1970's when The Knit With's founding proprietor, Marge Casale, saved this extraordinary house from the wrecking ball. The Detweiler House has been the home of The Knit With since, the upstairs being the founder's abode where she raised her two youngest daughters and, now, occupied by her children. During the Revolutionary War, The Detweiler House served the Colonials as a field hospital during and following George Washington's loss at the Battle of Germantown and during the Colonials' retreat to Valley Forge with the approach of winter. Like all structures in a wide swath along the crest of the Whitemarsh Valley, The Detweiler House was burned by forces loyal to the British Crown. A young Colonial picket is sometimes seen keeping watch near the stone wall to the rear of the property where there is an excellent view of the approach from Germantown, and, from time to time, there are reports of the aroma of baking bread -- perhaps a harkening to Mary Wood who openly defied the British and retrieved her bread trough from her burning house. Luckily, only the roof and garret of the house burned. During the period preceding the War Between the States, The Detweiler House was a way-station on the Underground Railroad with fugitives hidden in a cave accessible from the house's cellar. The entrance to the cave was, in 1868, ordered sealed by the City of Philadelphia and its exact whereabouts is now lost to time. During her lifetime, Marge was constantly restoring and rehabilitating The Detweiler House, among other jobs, replacing the worn 1795 shake shingles and giving the pegged timbers their first sheathing, modernizing the heating, plumbing and electrical infrastructure and, of course, maintaining and improving the house and its grounds from the near total dilapidation of the 1970's. The grounds of The Detweiler House contain many unusual species of flowering flora, all notable for their aromatic fragrances, and all carefully collected and cultivated by Marge during her lifetime--with roses and lilies being among her special floral friends together with almost 30 varieties of daffodil. From the first blush of Spring blossoms, through the Autumn's final frost, a dazzling display of floral color and texture is daily present somewhere on the grounds. Marge's love for majestic spruces and the stark beauty of black walnuts in Winter is well documented with her artful setting of several trees of both species, enhancing the appearance and privacy of the property on busy Germantown Avenue. Occasionally, the grounds are opened for tours but otherwise the gardens are closed to the public as are the upstairs living quarters.